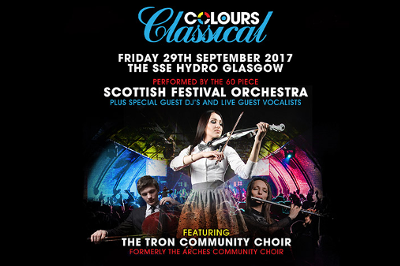 Celebrate 20 years of the Arches at The SSE Hydro on Friday 29 September 2017 with Colours Classical. Arches legend Judge Jules hosts this melding of dance with classical music, celebrating the Glasgow club on one amazing night. Featuring guest spots from DJ’s Danny Rampling and Seb Fontaine back to back with Tall Paul and the 60 piece Scottish Festival Orchestra running through club classics from 1995 to 2015. They’ll be joined by the Tron Community Choir (formerly the Arches Community Choir) and guest vocalists Christina Novelli and Bobbi Despasois.